In this area northeast of Mobile, the waters of the Alabama and Tombigbee Rivers merge into a maze of channels, creeks and bayous that make up the Mobile-Tensaw Delta. Though best explored by boat, these bottomlands can be accessed at several points along the eastern periphery from AL 225 and AL 59. The main attraction for birders is the abundance of breeding songbirds; other species such as large waders and kites also can be seen. Early May is the best time to do this loop. Start at the northern extreme of this loop, where good woodland birding may be found and then work your way southward. Insect repellent is a must! 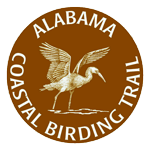 Cliff’s Landing is one of the best spots in Alabama (south of I-65) to view Swallow-tailed and Mississippi Kites in the spring and summer. Look for kites and other raptors across the river to the west, with best light in the morning. Historic Blakeley State Park offers opportunities to tour a preserved Civil War Battlefield, visit the site of one of the oldest towns in the state, and learn about the plants and animals that inhabit Mobile Bay and the Mobile/Tensaw River Delta, along with observing wading birds and waterfowl in the Tensaw and woodland species in the mixed hardwood/pine forest. The Mobile-Tensaw Delta Wildlife Management Area is comprised of a variety of habitats-from flooded hardwood bottoms to freshwater marshes. Red-shouldered Hawk, Prothonotary Warbler and Northern Parula are some of the species seen during the breeding season. During summer months, Swallow-tailed Kites may be observed flying just above treeline. Splinter HIll Bog is a diverse and rich ecosystem, characterized by Long leaf Pine and an extensive Pitcher Plant bog. Bachman’s Sparrow, Sedge Wren and American Woodcock are possibie species to be seen along the trails. French Lake is located on the Clearwater Forever Wild Tract and features an access point into the vast Mobile-Tensaw Delta system via the Bartram Canoe Trail managed by the ADCNR State Lands Division. Several featured trails start from this launch offering great opportunities to experience the natural wonders of the Delta.